You know, an unexpected earthquake and hurricane really liven things up during an otherwise dull first week of term. Though, admittedly, I didn't realize the earthquake was actually an earthquake until making it to Starbucks and finding myself amongst noisy chatter concerning the coming of the apocalypse. I just thought it was, you know, construction. Not to mention the irony of Hurricane Irene hitting this weekend [by irony I mean the name; as if I didn't already have Sherlock on the brain 20 hours a day, it somehow finds a way to permeate every aspect of my existence]. Life is full of unexpected surprises, I suppose. Anyway, first week is over, and I'm heading home for the weekend. On my way back, I'll be making a pit-stop in the city to visit Brinay and bring her a [not-so-surprise] treat for her birthday this weekend. 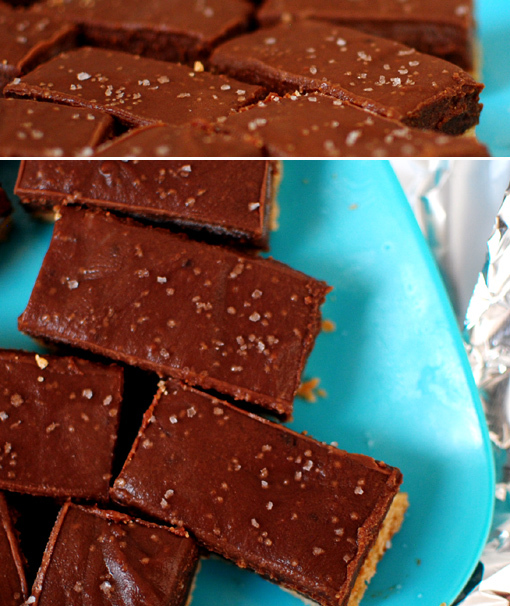 Sea salted chocolate-caramel shortbread bars. I asked Brinay a few days ago what she would want if I, hypothetically of course, happened to bake her something for the occasion. All she said to me was "chocolate," but that was more than enough. I happened across a recipe for chocolate dulce de leche bars on the interweb, but altered the recipe to my own tastes. Mainly with the addition of sea salt on top. Chocolate is wonderful for its versatility, and I wanted to try something new. Chili powder was an option as well, though I think that's best suited for a dessert a little...grander. A mousse or cake, perhaps. But birthday bars? Nah. For these, I kept 'em short, sweet, and just a little bit salty. Preheat oven to 375 degrees Fahrenheit and line and grease an 8x8-inch square pan. To prepare the crust, beat butter, sugar, and vanilla until smooth and fluffy. Add in flour, almond meal, pecans, and salt, and mix until the dough comes together. Press dough evenly onto the base of the pan. Bake for 13-15 minutes, until crust is golden-brown. Let cool at least 30 minutes. To prepare the chocolate topping, simmer heavy cream and dulce de leche in a medium-sized saucepan over medium heat. Whisk mixture until dulce de leche is completely melted. In a separate bowl, whisk egg yolks. Slowly pour about 1/4 cup of the hot caramel mixture into the egg yolks, while still whisking, to temper them. Pour the hot egg yolk mixture back into the saucepan, and mix until the chocolate begins to thicken. Continue whisking at a simmer for 4-5 minutes, until mixture is thick enough to resemble pudding. Remove the pan from the heat and whisk in the chocolate. Let the chocolate mixture cool 10-15 minutes before pouring on top of the cooled crust. Chill the bars, uncovered, for an hour. Sprinkle the sea salt evenly over top of the chocolate, and then return the bars to the fridge and chill for another two hours before slicing. Store bars in the fridge for up to 3 days. These are quite delicious. The topping is soft, almost the consistency of a dense mousse, and each bite melts in your mouth in the most pleasant way. You want to use a very small amount of sea salt on top, since sea salt itself has such an intense depth of flavor. Just a hint is enough to make you think there's something more than just chocolate, but hardly enough to make you realize it until you lick your lips and taste traces of saltiness left behind. A new dimension to ordinary chocolate bars. One I'm hoping Brinay will enjoy when I see her in a few hours. As for the semester, I'm anticipating a busy one. I've already been confronted with more reading than I expected having to do on a week-to-week basis, none of which I'm too excited about. Still, not having class on Fridays helps. And I mean, if one of your required readings is a biography of Leonardo da Vinci, it can't be all bad. I anticipate many days of tea, scones, and art history in my future. 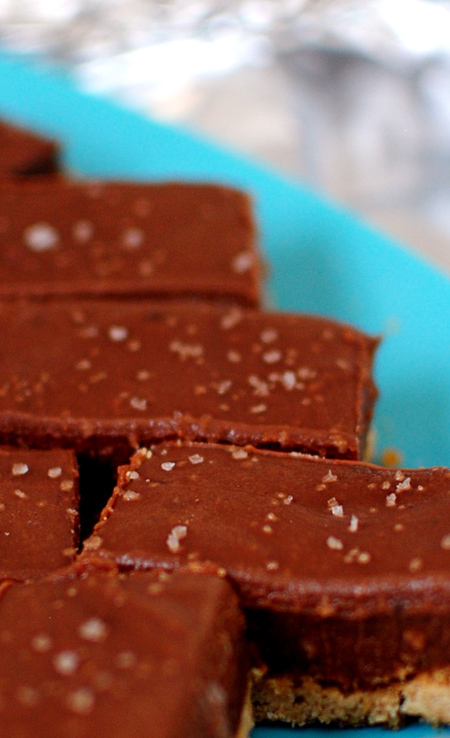 They look delicious and sound quite easy to whip up - Am very tempted to try it this weekend!